The Golden Chariot Journey is another exotic train journey that takes its passengers through the World Heritage Sites across the state of Karnataka. This is the one and only Luxury Train in Southern India. Experience the wild life and exotic beaches bordering Goa. The Golden Chariot Luxury Journey starts from the busy city of Bangalore also known as the IT hub of India. The journey consists of the 7 Nights/ 8 Days journey across several stone structures, ancient temples, Wildlife Safaris & Jungles, and read on. The Golden Chariot Train Tour starts and once again ends in Bangalore. The Golden Chariot on board facilities highlights the ancient temple structures as the passenger saloons are made in the same way. There are a total of 44 Air Conditioned cabins with one cabin for the physically challenged. Others include 17 double bedded cabins and 26 Twin bedded cabins. There are four sleeping chambers in each of the 11 interconnected cabins. 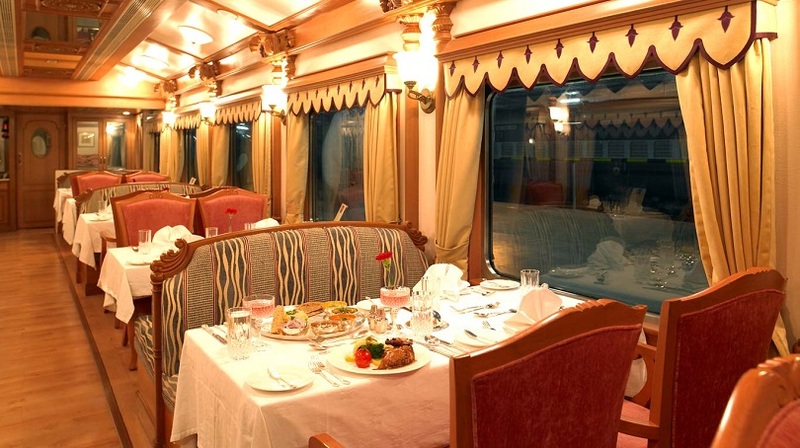 There are two dining cars that are inspired by the two ancient temples in Hampi and Halebid. Passengers get to taste the variety spread of vegetarian and non – vegetarian cuisine here. Top Things to Do on the Golden Triangle Tour in India. The passenger salons in the Golden Chariot train also have 220 AC electric sockets for battery charge. There is provision for LCD TV, a vanity desk and a tiny little wardrobe too. The private washrooms are equipped with 5 star hotel accessories. The Golden Chariot is also equipped with the Spa & Gym Facility that provides the ancient Ayurveda massages. These will further relax your soul and in turn acts as a cure to the modern day stress and fatigue. 12 Amazing India’s Destination to Visit in Pitter-Patter. Those who would like to get physically fit and get a work out can do so at the Golden Chariot Gymnasium. To relax, there is a Lounge Bar Coach called Madira. The Cigar Bar Lounge gives the feel of the plush interiors of the Mysore Palace of the 20th Century. 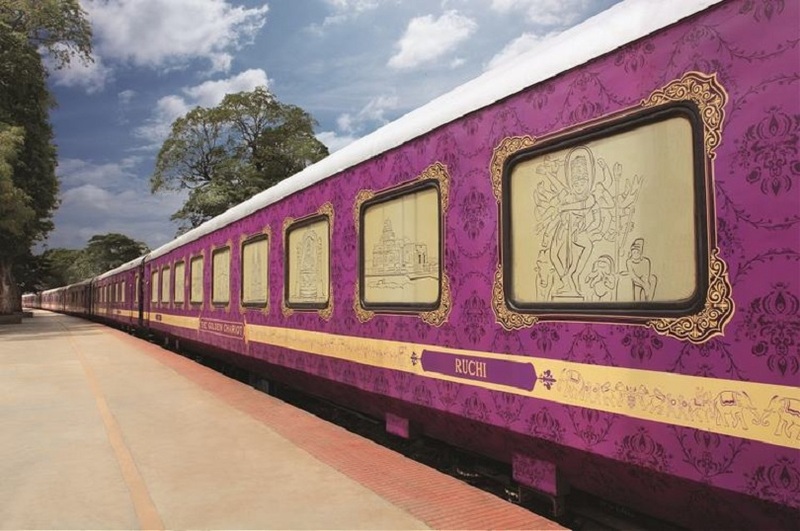 Apart from being known as the Only Luxury Train in South India, the Golden Chariot is also the winner of the prestigious award called “Asia’s Leading Luxury Train.” This was awarded at the Travel Awards, 2013. Do take time out to check out the Golden Chariot Add-On Package Tours as well as the other fares and tariff. Now this luxury train in India is not only on one tour but travels on two various travel circuits. This includes the – Pride of South & the other is Pride of Southern Splendour. Top Most Famous Historical Sites in India. The Golden Chariot Pride of South is an 8 Days and 7 Nights package that starts from Bangalore and returns to Bangalore. It covers Kabini, Mysore, Hassan, Hampi, Badami, Goa and back to Bangalore on Day 8. The order of the places is in the order of the days. Some Kickass Ways to Enjoy Summer Season in India. The Golden Chariot Southern Splendour is also the 8 Days and 7 Nights tour starting and ending in the city of Bangalore. On day 1, it starts of at Bangalore. It then covers Chennai & Mahaballipuram on Day 2. On Day 3, Day 4, and Day 5 it covers Pondicherry, Tanjavur, and Madhurai respectively. On Day 6 of the tour it touches Trivandrum & Kovalam Beach. Then on Day 7, reach the Kerala Backwaters and Kochi before heading back to a return trip on Day 8. Golden Triangle of India- All You Need to Know. Honeymoon in Alleppey – How to make your romantic getaway truly everlasting?